I want to talk with you about white supremacy. I want us, and I mean white people in large scale, to be real with each other: we’ve got to uproot racism on every level, and that includes internalized white supremacy showing up in our social justice work! The degree to which we can see how white supremacy reproduces itself in our social justice movements directly shapes our movements’ capacity to coordinate across race, class, sector, region, and borders. We want to share with you a few ways that Catalyst Project notices white supremacy repeatedly playing out in social justice work. Do they feel familiar? Can you name examples in the history of movements working for liberation? Universalizing white experience happens when “mainstream” white ways of doing things are seen as normal, standard and “good”. This is reinforced everyday by institutions like schools, popular culture and media outlets—that highlight white leadership, culture, beauty, and everyday ways of being. White people often subconsciously bring this assumption of normality and superiority to social justice movements, thinking that “my ways of organizing and protesting are the right/best/only ways”, and speaking as if everyone in the room shares a particular experience– one that is very shaped by white privilege. This makes it hard to understand and support the leadership and political strategies of non-white people and communities. The particular type of white experience that gets universalized is usually male, class privileged, culturally Christian, able-bodied, and shaped in other ways that are privileged in dominant culture. Because of how white experience is universalized, white activists tend to ignore or misunderstand the last 500 + years of resistance and liberation struggles led by people of color. So instead of working to support and build up these struggles, they often try to “diversify,” or to recruit people of color into mostly white organizations. In a white supremacist society, all issues intersect with racism. Yet white-dominated social justice movements often strip away the racial context and history of issues. They also often minimize the impacts of racism and the priority of addressing them. This takes away the power of those impacted by racism to define their own experience and struggle. By keeping the strategies and impacts of white supremacy hidden, deracialization also makes it really hard to change them. – This term was developed by Critical Resistance, a prison industrial complex abolition organization. Many white people—poor and working class people, women, queers, people with disabilities, etc—experience white privilege, but also face other types of oppression. White folks often fight the ways we experience oppression, while simultaneously selling out communities of color to maintaining white privilege. This can look like single issue organizing, or even sacrificing the goals and campaigns of activists of color, in order to win short term gains specific to their own agenda. This pattern of white privilege has shattered the potential of various multiracial movements for radical social change. We offer this list as one tool to help recognize these patterns so we can stop perpetuating them. We thank our mentors and allies for help developing this list. For more resources go to our website www.collectiveliberation.org. 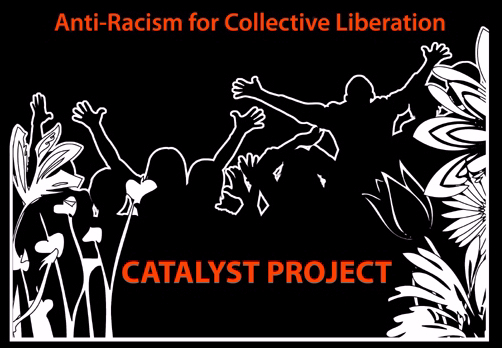 We hope this is helpful and we encourage you to share it with others engaged in struggle for collective liberation.